1. Early Withdrawals. An early withdrawal normally is taking cash out of a retirement plan before the taxpayer is 59½ years old. 2. Additional Tax. If a taxpayer took an early withdrawal from a plan last year, they must report it to the IRS. They may have to pay income tax on the amount taken out. If it was an early withdrawal, they may have to pay an additional 10 percent tax. 3. Nontaxable Withdrawals. The additional 10 percent tax does not apply to nontaxable withdrawals. These include withdrawals of contributions that taxpayers paid tax on before they put them into the plan. A rollover is a form of nontaxable withdrawal. A rollover occurs when people take cash or other assets from one plan and put the money in another plan. They normally have 60 days to complete a rollover to make it tax-free. 4. Check Exceptions. There are many exceptions to the additional 10 percent tax. Some of the rules for retirement plans are different from the rules for IRAs. 5. If someone took an early withdrawal last year, they may have to file Form 5329, Additional Taxes on Qualified Plans (Including IRAs) and Other Tax-Favored Accounts, with their federal tax return. Form 5329 has more details. When taxpayers file their tax return, it’s important they use the right filing status because it can affect the amount of tax they owe for the year. It may even determine if they must file a tax return at all. Taxpayers should keep in mind that their marital status on Dec. 31 is their status for the whole year. Sometimes more than one filing status may apply to taxpayers. When that happens, taxpayers should choose the one that allows them to pay the least amount of tax. 1. Single. Normally this status is for taxpayers who aren’t married, or who are divorced or legally separated under state law. 2. Married Filing Jointly. If taxpayers are married, they can file a joint tax return. If a spouse died in 2016, the widowed spouse can often file a joint return for that year. 3. Married Filing Separately. A married couple can choose to file two separate tax returns. This may benefit them if it results in less tax owed than if they file a joint tax return. Taxpayers may want to prepare their taxes both ways before they choose. They can also use this status if each wants to be responsible only for their own tax. 4. Head of Household. In most cases, this status applies to a taxpayer who is not married, but there are some special rules. For example, the taxpayer must have paid more than half the cost of keeping up a home for themselves and a qualifying person. Don’t choose this status by mistake. Be sure to check all the rules. 5. Qualifying Widow(er) with Dependent Child. This status may apply to a taxpayer if their spouse died during 2014 or 2015 and they have a dependent child. Other conditions also apply. All taxpayers should keep a copy of their tax return. Beginning in 2017, taxpayers using a software product for the first time may need their Adjusted Gross Income (AGI) amount from their prior-year tax return to verify their identity. The IRS wants taxpayers with disabilities and the parents of children with disabilities to be especially aware of whether they qualify for the EITC. People with disabilities are often concerned that a refund will impact their eligibility for one or more public benefits, including Social Security disability benefits, Medicaid and Food Stamps. Refunds, including refunds from tax credits such as the EITC, are not counted as income for purposes of determining eligibility for benefits. This applies to any federal program and any state or local program financed with federal funds. As many as an estimated 1.5 million people with disabilities miss out on this credit because they fail to file a return, according to the IRS. Many of these non-filers fall below the income threshold requiring them to file, but the service urges them to consider filing anyway to possibly receive the EITC. To qualify, the taxpayer must have earned income. Usually, this means income either from a job or from self-employment. But taxpayers who retired on disability can also count as earned income any taxable benefits they receive under an employer’s disability retirement plan. These benefits remain earned income until the disability retiree reaches minimum retirement age. The IRS emphasized that Social Security benefits or SSDI do not count as earned income. Additionally, taxpayers may claim a child with a disability or a relative with a disability of any age to get the credit if the person meets all other EITC requirements. The IRS’s EITC Assistant can help determine a taxpayer’s eligibility and estimate the credit. Crooks have tried all sorts of e-mails scams, but almost everyone has figured out that the IRS does not send out notices by e-mail. So crooks have changed their tactics. Now, there are reports of taxpayers receiving by mail (or email) fake notices requiring immediate payment to a P.O. Box. The P.O. Boxes are located in cities where the IRS has service centers, but of course are not IRS P.O. Box addresses. These scammers have duplicated the look of official IRS mail notices, which to the untrained eye would lead one to believe a notice was really from the IRS. 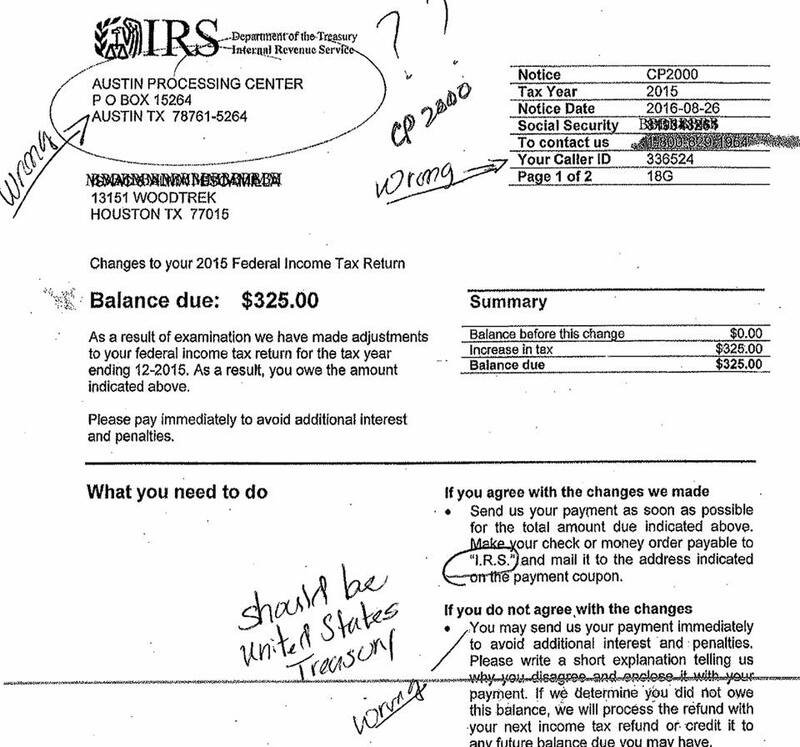 So be extremely cautious of any notice you may have received from the IRS. If a notice is demanding immediate payment and there has not been any prior contact by the IRS over the issue, then the notice is probably from a scammer. Reports indicate the initial letters were numbered CP-2000. Here is a sample fake IRS CP-2000 supplied by Iowa State University. Don’t be a victim, have any notice you receive from the IRS, or any tax authority for that matter, reviewed by this office before taking action. MONTGOMERY, Ala. — More than a half million Alabamians could have their tax refunds delayed next year. According to Al.com, many within the state could find themselves waiting until almost spring instead of the typical January time frame because of an IRS procedure change. The IRS will hold tax refunds for filers claiming the Earned Income Tax Credit or the Additional Child Tax Credit until at least Feb. 15. In 2014, about 507,000 Alabamians filed for ETC credits. Those in the state were a part of the 27.5 million people who filed for the same credits throughout the country. In Alabama, the EITC average return amount was $2,784. The IRS usually issues refunds with 21 days or less after processing begins on a return. The agency began accepting returns Jan. 19 this year. Business Structure. An early choice you need to make is to decide on the type of structure for your business. The most common types are sole proprietor, partnership and corporation. The type of business you choose will determine which tax forms you file. Business Taxes. There are four general types of business taxes. They are income tax, self-employment tax, employment tax and excise tax. In most cases, the types of tax your business pays depends on the type of business structure you set up. You may need to make estimated tax payments. If you do, you can use IRS Direct Pay to make them. It’s the fast, easy and secure way to pay from your checking or savings account. Employer Identification Number (EIN). You may need to get an EIN for federal tax purposes. Search “do you need an EIN” on IRS.gov to find out if you need this number. If you do need one, you can apply for it online. Accounting Method. An accounting method is a set of rules that you use to determine when to report income and expenses. You must use a consistent method. The two that are most common are the cash and accrual methods. Under the cash method, you normally report income and deduct expenses in the year that you receive or pay them. Under the accrual method, you generally report income and deduct expenses in the year that you earn or incur them. This is true even if you get the income or pay the expense in a later year. Employee Health Care. The Small Business Health Care Tax Credit helps small businesses and tax-exempt organizations pay for health care coverage they offer their employees. You’re eligible for the credit if you have fewer than 25 employees who work full-time, or a combination of full-time and part-time. The maximum credit is 50 percent of premiums paid for small business employers and 35 percent of premiums paid for small tax-exempt employers, such as charities. For more information on your health care responsibilities as an employer, see the Affordable Care Act for Employers page on IRS.gov. Usually, profits you earn are taxable. However, if you sell your home, you may not have to pay taxes on the money you gain. Here are ten tips to keep in mind if you sell your home this year. Exclusion of Gain. You may be able to exclude part or all of the gain from the sale of your home. This rule may apply if you meet the eligibility test. Parts of the test involve your ownership and use of the home. You must have owned and used it as your main home for at least two out of the five years before the date of sale. Exceptions May Apply. There are exceptions to the ownership, use and other rules. One exception applies to persons with a disability. Another applies to certain members of the military. That rule includes certain government and Peace Corps workers. For more on this topic, see Publication 523, Selling Your Home. Exclusion Limit. The most gain you can exclude from tax is $250,000. This limit is $500,000 for joint returns. The Net Investment Income Tax will not apply to the excluded gain. May Not Need to Report Sale. If the gain is not taxable, you may not need to report the sale to the IRS on your tax return. When You Must Report the Sale. You must report the sale on your tax return if you can’t exclude all or part of the gain. You must report the sale if you choose not to claim the exclusion. That’s also true if you get Form 1099-S, Proceeds From Real Estate Transactions. If you report the sale, you should review the Questions and Answers on the Net Investment Income Tax on IRS.gov. Exclusion Frequency Limit. Generally, you may exclude the gain from the sale of your main home only once every two years. Some exceptions may apply to this rule. Only a Main Home Qualifies. If you own more than one home, you may only exclude the gain on the sale of your main home. Your main home usually is the home that you live in most of the time. First-time Homebuyer Credit. If you claimed the first-time homebuyer credit when you bought the home, special rules apply to the sale. For more on those rules, see Publication 523. Home Sold at a Loss. If you sell your main home at a loss, you can’t deduct the loss on your tax return. Report Your Address Change. After you sell your home and move, update your address with the IRS. To do this, file Form 8822, Change of Address. Mail it to the address listed on the form’s instructions. If you purchase health insurance through the Health Insurance Marketplace, you should also notify the Marketplace when you move out of the area covered by your current Marketplace plan. If you client purchased 2016 health care coverage through the Health Insurance Marketplace, you may have chosen to have advance payments of the premium tax credit paid to the insurance company to lower the monthly premiums. If this is the case, it’s important to let the Marketplace know about significant life events, known as changes in circumstances. These changes may affect the premium tax credit. Reporting the changes will help avoid getting too much or too little advance payment of the premium tax credit. An increase or decrease in income. The birth or adoption of a child. Starting a job with health insurance. Gaining or losing eligibility for other health care coverage. Name change. The names and Social Security numbers on your tax return must match your Social Security Administration records. If you change your name, report it to the SSA. To do that, file Form SS-5, Application for a Social Security Card. You can get the form on SSA.gov, by calling 800-772-1213 or from your local SSA office. Change tax withholding. A change in your marital status means you must give your employer a new Form W-4, Employee’s Withholding Allowance Certificate. If you and your spouse both work, your combined incomes may move you into a higher tax bracket or you may be affected by the Additional Medicare Tax. Use the IRS Withholding Calculator tool at IRS.gov to help you complete a new Form W-4. See Publication 505, Tax Withholding and Estimated Tax, for more information. Changes in circumstances. If you or your spouse purchased a Health Insurance Marketplace plan and receive advance payments of the premium tax credit in 2016, it is important that you report changes in circumstances, such as changes in your income or family size, to your Health Insurance Marketplace when they happen. You should also notify the Marketplace when you move out of the area covered by your current Marketplace plan. Advance credit payments are paid directly to your insurance company on your behalf to lower the out-of-pocket cost you pay for your health insurance premiums. Reporting changes now will help you get the proper type and amount of financial assistance so you can avoid getting too much or too little in advance, which may affect your refund or balance due when you file your tax return. Address change. Let the IRS know if your address changes. To do that, send the IRS Form 8822, Change of Address. You should also notify the U.S. Postal Service. You can ask them online at USPS.com to forward your mail. You may also report the change at your local post office. You should also notify your Health Insurance Marketplace when you move out of the area covered by your current health care plan. Tax filing status. If you’re married as of Dec. 31, that’s your marital status for the whole year for tax purposes. You and your spouse can choose to file your federal income tax return either jointly or separately each year. You may want to figure the tax both ways to find out which status results in the lowest tax. Select the right tax form. Choosing the right income tax form can help save money. Newly married taxpayers may find that they now have enough deductions to itemize on their tax returns. You must claim itemized deductions on a Form 1040, not a Form 1040A or Form 1040EZ. Deadline Extensions. Some members of the military, such as those who serve in a combat zone, can postpone some tax deadlines. If this applies to you, you can get automatic extensions of time to file your tax return and to pay your taxes. Combat Pay Exclusion. If you serve in a combat zone, your combat pay is partially or fully tax-free. If you serve in support of a combat zone, you may also qualify for this exclusion. Moving Expense Deduction. You may be able to deduct some of your unreimbursed moving costs on Form 3903. This normally applies if the move is due to a permanent change of station. Earned Income Tax Credit or EITC. If you get nontaxable combat pay, you may choose to include it in your taxable income. Including it may boost your EITC, meaning you may owe less tax and could get a larger refund. In 2015, the maximum credit for taxpayers was $6,242. The average amount of EITC claimed was more than $2,400. Figure it both ways and choose the option that best benefits you. You may want to use tax preparation software or consult a tax professional to guide you. Signing Joint Returns. Both spouses normally must sign a joint income tax return. If your spouse is absent due to certain military duty or conditions, you may be able to sign for your spouse. You may need a power of attorney to file a joint return. Your installation’s legal office may be able to help you. Reservists’ Travel Deduction. Reservists whose reserve-related duties take them more than 100 miles away from home can deduct their unreimbursed travel expenses on Form 2106, even if they do not itemize their deductions. Uniform Deduction. You can deduct the costs of certain uniforms that you can’t wear while off duty. This includes the costs of purchase and upkeep. You must reduce your deduction by any allowance you get for these costs. ROTC Allowances. Some amounts paid to ROTC students in advanced training are not taxable. This applies to allowances for education and subsistence. Active duty ROTC pay is taxable. For instance, pay for summer advanced camp is taxable. Civilian Life. If you leave the military and look for work, you may be able to deduct some job search expenses. You may be able to include the costs of travel, preparing a resume and job placement agency fees. Moving expenses may also qualify for a tax deduction. Tax Help. Most military bases offer free tax preparation and filing assistance during the tax filing season. Some also offer free tax help after the April deadline.